Intelligent virtual assistants are the key to accelerating your self-service initiatives and creating rich online experiences. 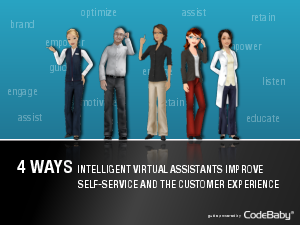 Intelligent virtual assistants (IVAs) are no longer considered a rare or even "cool" addition to online self-service and customer engagement platforms. They are quickly being acknowledged for their critical optimization, brand engagement, and financial value. IVAs are powerful tools that further automate self-service interactions. By design, IVAs enable customers to efficiently accomplish their online goals such as answering questions about their account, filling out forms or applications, or getting needed technical support. Organizations from health insurance companies to financial services to travel sites are integrating IVAs as a core piece of technology to not only enhance the customer experience but drive down costs through increased efficiencies, increase and expand revenue streams, and leverage and energize the brand across multiple channels and mobile devices. In fact according to Gartner, by the year 2013, at least 15% of Fortune 1000 companies will use a virtual assistant to serve up web self-service content and by the year 2015, will be a standard component of online interactions. This guide provides an overview of four main capabilities and benefits of using the IVA to engage, optimize, and right-channel.